This charming and inexpensive cuckoo clock gives you all the basic functions of a traditional cuckoo clock. The leaves and bird are hand carved from solid Linden wood. The when the clock strikes the hour or half-hour, the door opens, a cuckoo appears and calls along with the clock's gong strike. 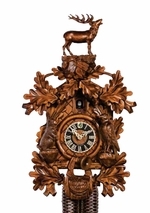 This clock is hand made in Germany and is distributed by Sternreiter. The mechanical brass movement is driven by two weights and time escapes with the tick of a traditional pendulum. The cuckoo call sound is made by two wooden whistles with bellows inside the clock case. This design is the most popular of all cuckoo clocks, and therefore is available with many different movements and configurations. See Video below of the clock too!